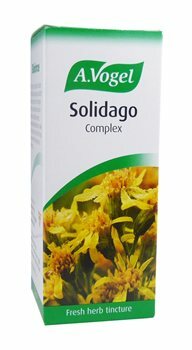 This tincture is a combination of the fresh herbs Solidago (Golden Rod), Birch, Horsetail and Restharrow.The majestic European Golden rod (Solidago virgaurea) and the fresh leaves from the elegant Birch are combined with two invasive but useful weeds, Horsetail and Restharrow, to make this tincture, which Alfred Vogel recommends throughout his writings. Contains the tinctures of : fresh Solidago virgaurea* (Golden Rod) herb 69%, fresh Betula pendula (Birch) leaves 18%, fresh Ononis spinosa (Restharrow) herb 7% and fresh Equisetum arvense (Horsetail) herb 6%. Adults: 10-15 drops 3 times daily in a little water.